Hampden Park, the national stadium of Scotland, home to the Glaswegian football club Queen's Park, is the venue that has hosted most of the international football clashes between England and Scotland since it's completion in 1903. 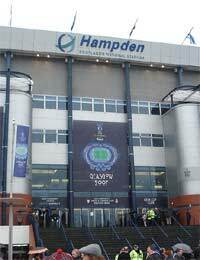 The stadium now known as Hampden Park is the third one to have been built, and with the extensive renovations' in the 1990s, it could be argued that it is in fact the fourth. The first Hampden Park was built by Queen's Park FC on part of the Queen's Park recreation ground from which they took their name. The first (recognised) international football game, between England and Scotland, was held at the West of Scotland Cricket Ground in 1872. They continued annually, alternating between venues in England and Scotland, and in 1878 the first Hampden Park international was held. With the popularity of both international and club football it wasn't long before Queen's Park began to consider a new and larger venue but they were adamant that they would stay at their birthplace. The second Hampden Park ground was built five hundred yards to the north-east of the first one and hosted its inaugural international match in 1886, hammering England 7-2. But Queen's Park always had ambitions to be in control of their own destiny and had continually attempted to buy the land that the second Hampden Park had stood on rather than rent from the landlord, although unsuccessfully. So towards the turn of the century the club looked for and found a plot of land that they could buy for a flagship stadium. By this time Hampden Park had ceased to be the home of Scottish international football as other club grounds with better facilities and capacities had been built. In fact only three internationals matches against England were played at that second ground, the bulk of the matches before the opening of the third Hampden Park being played at the home of another Glasgow side, Celtic. Queen's Park had never been afraid of building facilities at their grounds but with the new ground fully in their ownership they invested heavily over the decades after the opening, building new stands and pavilions. Eventually the resulting temple to the new sport was to become the largest football ground in the world, a record it held until the opening of the Maracana in Rio de Janeiro in 1950. In 1906 Hampden Park wrested the prized international games away from Celtic Park and although the Scots lost that match 1-2, Hampden Park has remained the home of Scottish football ever since. In the 1980s the crown looked to have been lost again, to Ibrox, Glasgow Rangers ground, but a massive rebuilding programme, eventually kicked off in 1992, turned Hampden Park into an all-seater stadium, albeit with a lower capacity of 52,000. This was an inevitable result of the Taylor report, following a number of high-profile stadium disasters, and UEFA's stipulation that all-seater stadiums were required for competition matches. As a result Scotland's home qualifiers for the 1994 World Cup were held at Ibrox. The rebuilding programme took nearly a whole decade, in phases, to complete, and took Queen's Park to the brink of bankruptcy. But the stadium celebrated its 100th birthday in fine shape and plans are afoot to increase capacity to 70,000. In the recent European Championship qualifiers for the 2008 competition Scotland consistently beat quality opponents at home (and away) and were very unlucky not to qualify for the finals. Let's hope there are more great moments at Hampden Park in to come in the next hundred years.